Based on the consensus reached by President Xi Jinping and President Donald Trump during their meeting in Mar-a-Lago and as agreed by the two sides, the first round of China-US Social and People-to-People Dialogue will be held in Washington D.C., the United States on September 28. Vice Premier of the State Council Liu Yandong will co-chair the Dialogue with US Secretary of State Rex Tillerson. Then and there, the two sides will have an in-depth exchange of views on the cultural and people-to-people exchanges and cooperation between China and the United States. The Chinese side stands ready to work with the United States to promote the Dialogue to achieve positive outcomes. At the invitation of the government of the Republic of Angola, Vice President of the Chinese People's Political Consultative Conference Chen Yuan will travel to Luanda, the capital of Angola to attend the inauguration ceremony of President João Manuel Gonçalves Lourenço as the Special Envoy of President Xi Jinping on September 26. Q: Over the weekend, the DPRK Foreign Minister Ri Yong Ho, while giving his speech at the UN General Assembly, said it was inevitable that the DPRK would target the United States with missiles. US President Donald Trump responded by saying that the DPRK won't be around much longer. It seems that the war of words for the two countries has been continuing to escalate. Is China concerned that this war of words could lead to an actual real war happening on the Korean Peninsula? A: The Chinese side is really concerned about the current situation on the Korean Peninsula. The situation on the Korean Peninsula is highly complex, sensitive and grave. We maintain that the pressing task now is that all relevant parties should implement all the DPRK-related resolutions adopted by the UN Security Council, including the just adopted Resolution 2371 and 2375, in a faithful, complete and accurate manner. We hope that all relevant parties can exercise restraint instead of continuing provocating each other and seek the way out for the peaceful settlement of the issue instead of finding the outlet to let off steam. Only when all relevant parties shoulder their due responsibility, speak and act cautiously and work for the shared goal can we find a viable solution to the peaceful settlement of the Korean Peninsula nuclear issue through dialogue. Q: We have noted that recently during Foreign Minister Wang Yi's presence at the General Debate of the United Nations (UN) General Assembly, the Chinese side inked the Memorandum of Understanding (MOU) on the Belt and Road Initiative with the UN Department of Economic and Social Affairs. How many countries and international organizations have signed cooperative documents on the Belt and Road Initiative with the Chinese side up to now? A: That's right. On September 22 local time, Foreign Minister Wang Yi and UN Secretary-General Antonio Guterres who were present at the General Debate of the 72nd session of the UN General Assembly attended the signing ceremony of the Memorandum of Understanding on the Belt and Road Initiative Between the Ministry of Foreign Affairs of the People's Republic of China and the United Nations Department of Economic and Social Affairs held in New York, the UN headquarters. You can refer to the relevant information issued by us for details. As for the question raised by you just now, I can tell you that to date, there are 74 countries and international organizations that have inked cooperative documents with the Chinese side, which demonstrates that the Belt and Road Initiative has received more and more positive response and widespread support in the world since its initiation. I also want to point out in particular that the Belt and Road Initiative is important international public goods and it serves as an important platform for China to conduct cooperation with relevant countries and an open and inclusive platform for development. The reason why this initiative has won the support of and been actively participated by an increasing number of countries and international organizations is that while advancing the Belt and Road Initiative, the Chinese side always stays true to the vision of "extensive consultation, joint contribution and shared benefit" and is committed to promoting the building of a fair, equitable and transparent system of international trade and investment rules with the countries along the route of the Belt and Road Initiative. We are convinced that the cooperation under the Belt and Road Initiative will inject new impetus to the regional and world economic growth and contribute to the common development and prosperity of countries around the world. Q: China and Vietnam held a high-level border meeting this weekend and the border troops of the two countries conducted joint military drills. Can you give us more details about the military drills? In addition, have the two countries resolved the issues over an oil rig operated by Vietnam in the South China Sea? A: Regarding the specifics mentioned by you, you can refer to the detailed information released by the Ministry of National Defense on September 24. As for the exchanges between the two militaries of China and Vietnam you mentioned, the two Parties and two governments of China and Vietnam have maintained friendly exchanges and cooperation in all areas. There are some differences between the two countries in certain areas, but in accordance with the consensus reached by the leadership of the two Parties and two governments of China and Vietnam, the two sides are actively committed to properly handling their differences through friendly consultation and jointly upholding the sound momentum of the growth of China-Vietnam relations. Q: It is reported that the Kurdish autonomous government in Iraq has begun an independence referendum despite the strong objections from the Turkish government and the central Iraqi government. What is China's position on this referendum? Would China view the outcome of this referendum as legally binding according to international law? A: We have stated China's position on this issue on this occasion and our position remains unchanged. 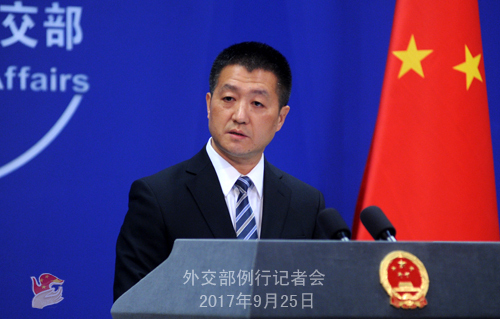 The Chinese government supports the sovereignty, unity and territorial integrity of Iraq and hopes that all relevant parties can resolve their disputes through dialogue, seek an inclusive solution that can accommodate both the history and reality and jointly safeguard the stability of Iraq and the region at large. This is conducive to promoting domestic reconstruction and counter-terrorism efforts on the part of Iraq and also serves the common interests of regional countries and the international community. Q: Yesterday the China Central Television (CCTV) covered the news that the Chinese embassies in the Caribbean countries assisted the transfer of the Chinese citizens in the hurricane-hit areas in Dominica. Up to now, how many Chinese citizens have been properly resettled? A: Recently, the Caribbean island nation Dominica took a direct hit from Hurricane Maria, which caused the paralysis of local transportation and communications, shutdown of airports and a scarcity of goods supplies. The Chinese government expressed condolences to the hurricane-struck Dominica and immediately launched the emergent humanitarian response mechanism. We will provide emergent humanitarian assistance as soon as possible. The Chinese government is highly concerned about the security of the Chinese citizens in Dominica. Following the hurricane, the Foreign Ministry immediately activated the emergency response mechanism to coordinate the Chinese Embassy in Dominica and Chinese embassies in the neighboring countries of Dominica to take measures to offer emergent assistance to the transfer of Chinese nationals in Dominica. Thanks to the concerted efforts of the Chinese embassies in Dominica, Antigua and Barbuda, Barbados and Trinidad and Tobago, as of the evening of September 22 local time, the first batch of 158 Chinese citizens, including two Taiwan compatriots and a just one-month-old baby, have been emergently transferred to Antigua and Barbuda and properly resettled. Now the transfer of relevant people is still intensively underway. Hereby I would like to avail myself of this opportunity to express my heartfelt thanks to the assistance and support provided by relevant countries. Q: According to the Yonhap News Agency, in response to Japanese media's reports that during a trilateral meeting with the ROK and Japanese leaders, President Donald Trump expressed strong dissatisfaction with the ROK's offering of $8 million worth of humanitarian aid to the DPRK at the UN General Assembly, the ROK President's Chief Press Secretary Yoon Young-chan said on September 22 that President Trump responded in a non-negative way to the ROK's humanitarian assistance to the DPRK then, and the aforementioned Japanese media reports are totally untrue. He also expressed strong regret to the relevant Japanese media's malicious and inaccurate reports on the US-Japan-ROK leaders' meeting by citing unidentified Japanese government sources, and said these acts by the Japanese side are likely to cause negative effects on the ROK-Japan relations. What's you comment on this? A: We have noted that besides this report, the Japanese leaders did express different views on the ROK's offering of humanitarian aid to the DPRK. 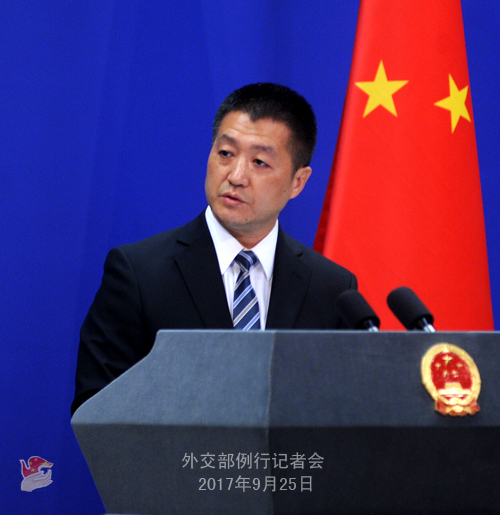 I stated China's position on the issue of the ROK's offering of humanitarian aid to the DPRK last week. The DPRK and the ROK descend from the same nationality, and the Chinese side has always supported the two sides in stepping up contact and communication, enhancing mutual trust, promoting reconciliation and cooperation and improving relations. We hope the relevant offering of humanitarian aid by the ROK to the DPRK can help with the improvement of inter-Korean relations and the abatement of the situation on the Korean Peninsula. Q: According to reports, Japanese Prime Minister Shinzo Abe today announced that he plans to dissolve the House of Representatives on September 28 because he wants to amend the Ninth Article of the Japanese Constitution by incorporating the Self-Defense Forces. This will become one of the major topics during the General Election. What is China's comment on this? A: Holding General Election belongs to Japan's domestic affairs and we do not comment on the internal affairs of other countries. However, with regard to the specific issues mentioned by you, due to historical reasons, Japan's moves concerning the issue of military security, especially any move on whether it can abide by the pacifist constitution, are followed closely by the international community, including the Asian countries. We have noted that this has also aroused attention inside Japan. So we hope that the Japanese side can use their concrete words and deeds to win the trust of the international community, including the Asian countries, and adhere to the path of peaceful development. Q: It is reported that the corrupt official Xu Xuewei at large gave himself up in the United States and has now returned to China. If so, do you have any comment on this case? A: The website of the Central Commission for Discipline Inspection of the Communist Party of China and Ministry of Supervision has issued the relevant information. Today, under the coordination and leadership of the Fugitive Repatriation and Asset Recovery Office of the Central Anti-Corruption Coordination Group as well as the close cooperation of relevant departments of Jiangsu Province, Xu Xuewei, the No. 91 fugitive on a "red notice" list of 100 most-wanted Chinese fugitives abroad returned to China and gave himself up. This is the second fugitive on the "red notice" list which was successfully pursued and repatriated by Jiangsu Province after Ren Biao within two months. Up to now, 46 people on the "red notice" list of 100 most-wanted Chinese fugitives abroad have been repatriated. Xu Xuewei is one of the fugitives on the "red notice" list whose hiding clues were released in the Notice on Hiding Clues of Some of the Fugitives Abroad issued by the Fugitive Repatriation and Asset Recovery Office of the Central Anti-Corruption Coordination Group on April 27 this year. His repatriation fully demonstrates the clear-cut attitude and firm resolve of the Central Government to pursue and repatriate all the fugitives no matter which country they fled to and no matter how long it will take. It once again proves that fleeing China doesn't mean that one can escape the punishment of the law and foreign countries are not the punishment-free paradise. Even though they fled to the remotest corners of the globe, they are bound to be pursued and brought to justice. It is the only right choice for the fugitives abroad to let go of illusions and return to China to give themselves up as soon as possible. Q: It is reported that the US Defense Secretary is visiting India and he is expected to promote the sale of F-16 military aircraft to India. Do you have any comment on that? A: We hope that the exchanges between any two countries can contribute to international and regional peace, security and development. Q: According to reports, recently, a supermarket which is run by Chinese nationals in the city of Manus in Papua New Guinea was caught on fire and left 20 Chinese employees unaccounted for. Could you give us some further information about them? A: At around 3 a.m. of the early morning on September 22 local time, a supermarket which is run by Chinese nationals in the city of Manus, the capital of Manus Province in Papua New Guinea, was caught on big fire and left 10 Chinese employees unaccounted for. So far, the remains of four bodies have been found on the scene. The Chinese Foreign Ministry and the Chinese Embassy in Papua New Guinea deeply mourn for the compatriots who were killed in the accident and conveyed our sincere condolences to the bereaved families. After learning the outbreak of the fire, the Chinese Embassy in Papua New Guinea attached great importance to it, immediately launched the emergency response mechanism and lost no time in contacting local police and fire department to urge them to make all-out efforts to put out the fire, search the trapped people and inform the Chinese side of the progress of the search and rescue efforts in a timely manner. The Chinese Embassy has got in touch with the families in China of some missing Chinese citizens and will provide needed assistance for them to go to Papua New Guinea to deal with the follow-up affairs. Now the relevant search and rescue efforts are still underway. The Chinese Embassy in Papua New Guinea will continue closely following the development of the accident and assist the bereaved families in properly handling the follow-up affairs. Q: Is China concerned that the earthquake on Saturday in the DPRK may be related to the previous nuclear test at the same site where the earthquake happened? A: As for the 3.4-magnitude earthquake happening in the DPRK on September 23, I believe you have noted the seismic measuring information issued by different parties. If you are interested in professional questions, I will refer you to professional institutions and personnel. Regarding China's position on the Korean Peninsula issue, we have stated it many times and we believe that all relevant parties are quite clear about it. Q: The baby panda born at the Ueno zoo was named xiang xiang in June this year. According to the zoo, the Chinese side highly praised this name. What do you think of the name? A: We have said many times that the giant panda is China's national treasure as well as the important ambassador of friendship between the Chinese people and people in many other countries. We are glad to see that the giant panda continues playing such a positive role. Q: Does China have any comment on the flights of US bombers and jets off the east coast of the DPRK over the weekend? A: We have noted the relevant report. I would like to repeat that the current situation on the Korean Peninsula is already highly tense and sensitive. We hope that all relevant parties can be cautious in words and deeds and refrain from making the remarks and taking the actions that will provocate each other and heighten the tensions. The escalation of tensions on the Korean Peninsula does not serve the interests of any party.